There was Clark Kent, a young man coming to terms with the awesome power that fate had granted him. Experience the majestic tale of his transformation from country boy into the world's greatest hero! The first few issues from the new creative teams on the Superman titles are collected in a brand new trade paperback! Written by Jeph Loeb, Joe Kelly, Mark Schultz, Stuart Immonen, and Mark Millar; art by Mike McKone, Doug Mahnke, German Garcia, Joe Phillips, Marlo Alquiza, Tom Nguyen, Joe Rubinstein, and Rich Faber; edited by Eddie Berganza; cover by McKone and Jimmy Palmiotti. Only $13.45 ! Collects the Superman: Y2K one-shot along with Superman , Adventures Of Superman #576, Superman: The Man Of Steel #98 and Action Comics #763. The stroke of midnight on New Year's Eve finds the City of Tomorrow in complete darkness; an unnatural darkness that threatens to engulf the whole world! This collection introduces the futuristic menace of Brainiac 13, and brings about lasting changes to Metropolis that will forever affect its citizens, including Superman and Lex Luthor! 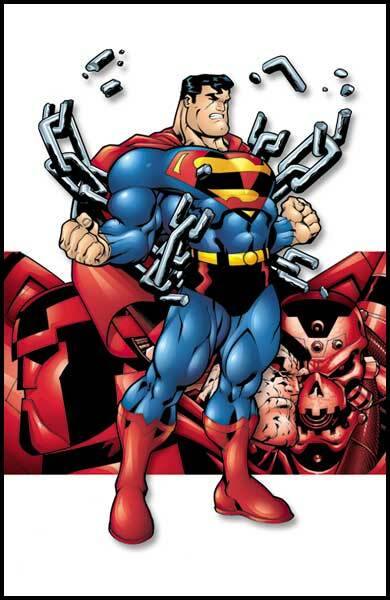 Join the Man of Steel as he faces the Y2K adventure! By Joe Kelly, Jeph Loeb, Stuart Immonen, Mark Millar & Mark Schultz/Butch Guice/Ed McGuinness/Immonen/Doug Mahnke/German Garcia/Kano/Cam Smith/various Only $11.96 !